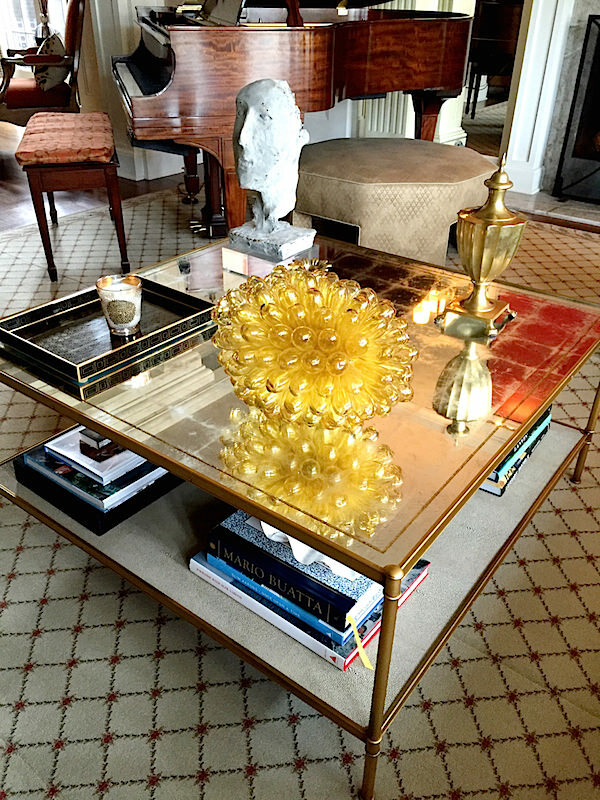 The first time I became acquainted with Nashville designer Jonathan Savage was several years ago on the stylish shopping site Taigan, where he maintains an online shop featuring a chic mix of coveted global finds from furniture to accessories. Fast forward to this past spring when I was in Nashville to moderate a panel at the Antiques & Garden Show. Jonathan, who hosted a smashing cocktail party in celebration of the show at his home, below, was kind enough to connect and tour me around town to see some local sites and several of his projects. While he grew up in Tennessee, Jonathan took a few detours before returning there to make Nashville his home. Following studies in architecture and design at the American University in London and O’More College of Design in Franklin, Tennessee, he worked in New York at David Kleinberg, where he honed his design skills. Now with his own Nashville based design firm, Jonathan lives with his partner Bradley Wensel and adorable dog Artie in a stylish Belle Meade home. Originally designed by Richard Himmel, the house’s modern architectural details set the tone for Jonathan’s chic eclectic approach. The stainless front doors feature a circle motif, which he continued as a theme throughout. 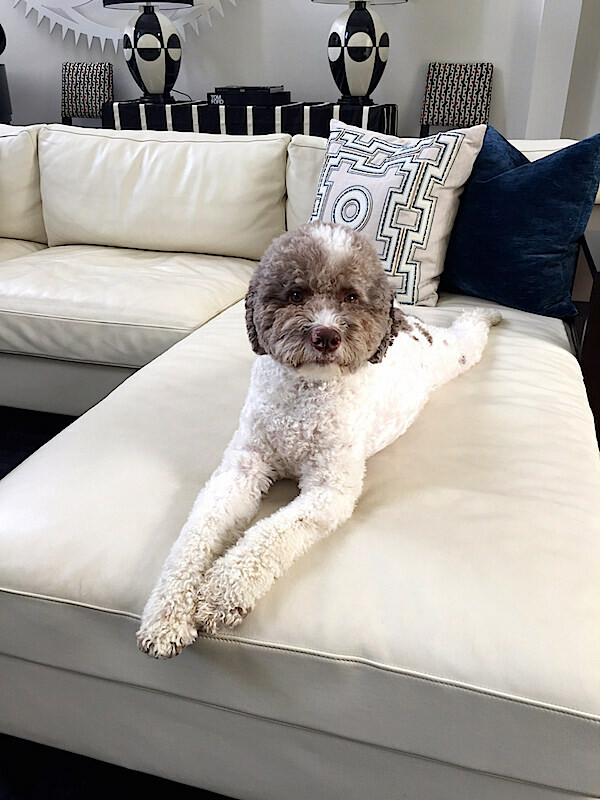 I must admit to being a tad obsessed with the wooly Steiff-like Artie, an Italian truffle hunting Lagotto Romagnolo, who just happens to be the perfect accoutrement to the graphic neutrals of Jonathan’s elegant interior. For a couple downsizing from their own Belle Meade home to a modern high rise downtown, Jonathan updated a dark inadequate kitchen into a bright space with plenty of warmth. 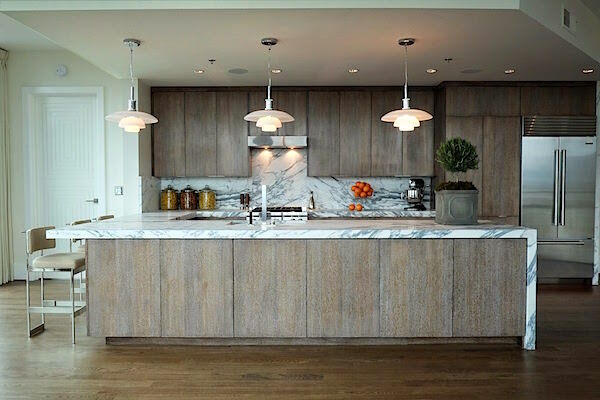 It’s all about simple lines and rich materials as cerused oak cabinets and Calacatta S marble are paired for a clean crisp contrast. In the West End, we visited another couple who had downsized into luxe townhouse living. 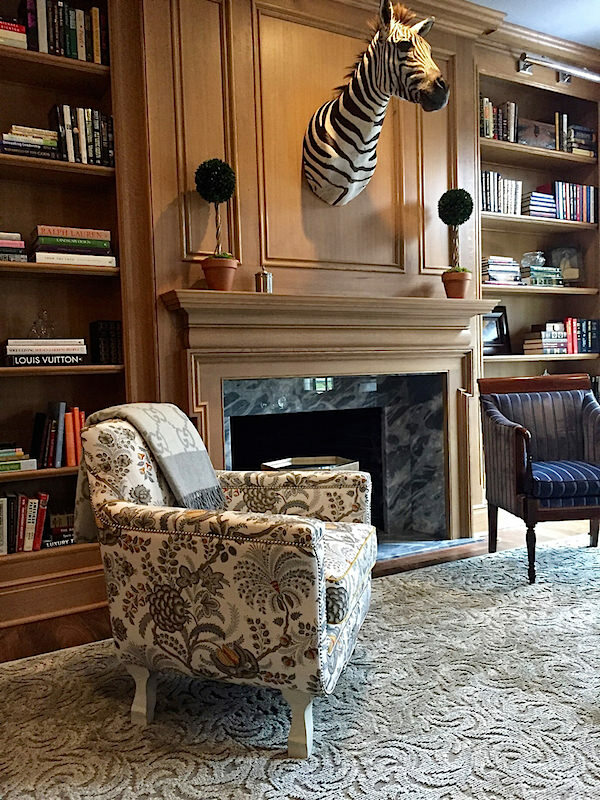 Favorites of their own furnishings melded with judicious new selections and a variety of chic art and accessories for a livable space that allowed the clients to live with what they loved in updated style. We took a drive to the Forrest Hills section of Nashville where we visited a recently completed project. For a family of four, Jonathan completely renovated the main floor to create a more open plan perfect for family living and elegant entertaining. The library, above, is a sophisticated space with a playful attitude, with special attention to texture, pattern and a rich yet light palette. And while I didn’t get to see his finished project for the inaugural 2016 Southeastern Designer Showhouse in Atlanta, above, in person, I did get to peek at Jonathan’s wallpaper collaboration with Carlton V that was showcased in the bedroom. The wallcovering is a reworking of a retired Dorothy Draper design, “Shatter” from the Carlton V archives. Recolored in five fresh new colorways, it was just the right combination of contemporary design with a historical context that Jonathan had been wanting. Partnering with Calvin Klein Home furnishings, the resulting room is a modern, understated, elegant space. Put Jonathan Savage on your list as a young designer to watch. And thank you Jonathan for a fun couple days out and about in your amazing town! This entry posted in architecture, interior design, travel. 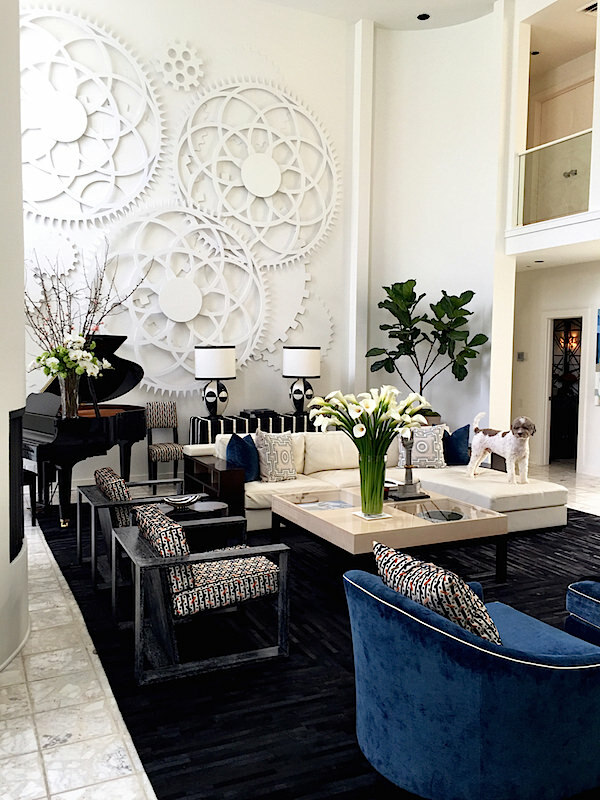 Entry Tags: interior design, jonathan savage, Nashville Bookmark the permalink. The ‘wall of gears’ artwork .. What is it made of and source for obtaining. Great article. I’m not sure what they are made of but they are one of a kind. A great piece on a wonderful designer. Bravo to both. Now, here is a man that understands design! Thanks for introducing him to me. I am also interested in the “wall of gears” artwork and what it is made of? Are they antiques or crafted as art? Great article- Thanks! Thank you Danielle. From my understanding, they were custom made by event designer David Stark for the Swan Ball in Nashville. Jonathan bought them after the event as part of a charity auction. Beautiful, thank you for sharing! I also have a Lagotto, Leonardo. I found your blog on a friends Facebook. What a wonderful and talented designer Jonathan Savage is. His living room is absolutely gorgeous. I am an interior design groupie and read all the design magazines Elle Decor,Architectural Digest, Veranda,House Beautiful etc. I cannot believe that I have not read about him in these magazines and cannot find that much about him. The only way that I was made aware of his wonderful talents was on a blog. I would love to know who made the wooden armchairs in his living room. Delighted you have found Quintessence Catherine – do stop back again – or subscribe!! The chairs are Armani Casa. Great article on a fabulous designer and even better person. Beautiful work! I have to admit that as interesting as this home is, Artie takes the prize…a beautiful, fascinating dog! 83 queries in 0.644 seconds.